This week on the Streamisho, Jasper and Joost discussed the upcoming (and long-awaited) art book, unveiled the new Ultimate Skin “Scourge Captain McPain” (coming in update 3.3) and talked about the progress on Galactron. Didn’t catch the show live? No worries, we’ve posted the entire show on Youtube and included it below. 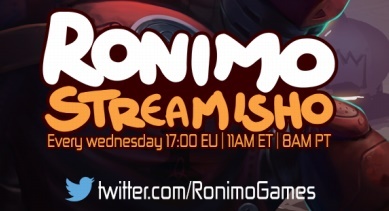 Tune in to the Ronimo Streamisho over at Twitch.tv/RonimoGames every Wednesday at 17:00 EU time, 11AM Eastern, and 8AM Pacific for news, gameplay, and reveals! Participate in the raffles and you might win an exclusive Roboscoop skin!